Happy 4th of July! I have a lot of red, white and blue in my closet, but I always try to challenge myself to pick out something unique that I haven't worn before for the holiday. The Peter Pan collar top I am wearing was actually discovered recently by me while cleaning out my closet. About once or twice a year (usually in the summer when I have more time and energy), I organize and purge the contents of my closet. In the midst of doing this last week, I found this blouse in the dark recesses of some nook. Since it still fit and is very cute, I put it on a hanger and gave it a more prominent place in the hierarchy of my closet. When deciding on something to wear with this gondola-striped skirt the other day, which is a throwback from a few years ago at J. Crew, I instantly reached for my new found treasure of a top. I am sure that, like me, you all have a plethora of red, white and blue in your closet, but below you will find my wishlist of items in this patriotic color scheme for this summer. 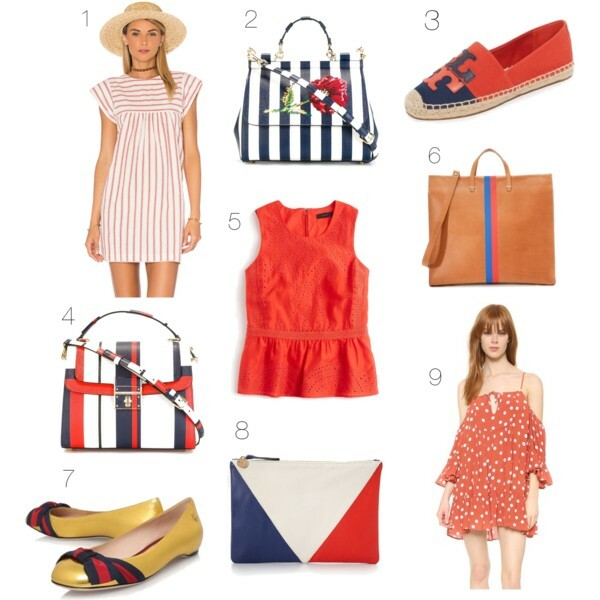 The nice thing about red, white and blue is that it's fun to wear all summer long, not just for the 4th of July! 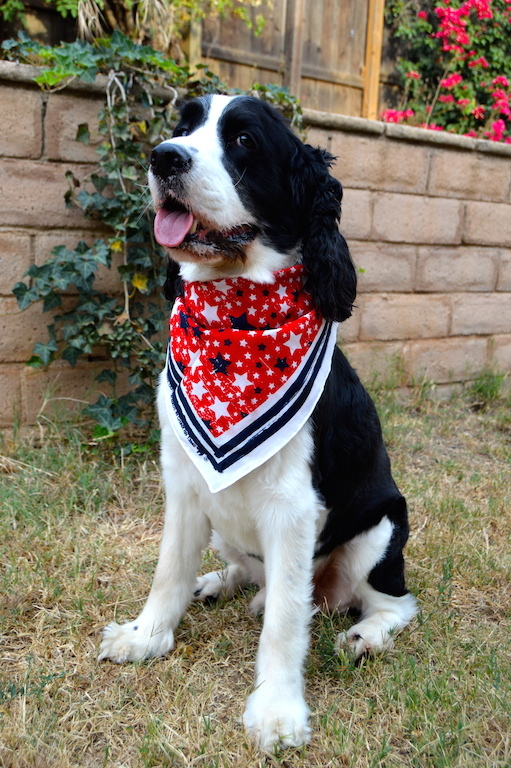 In case you were wondering where the "cool" in my title comes from, it refers to my dog William in his new patriotic handkerchief! 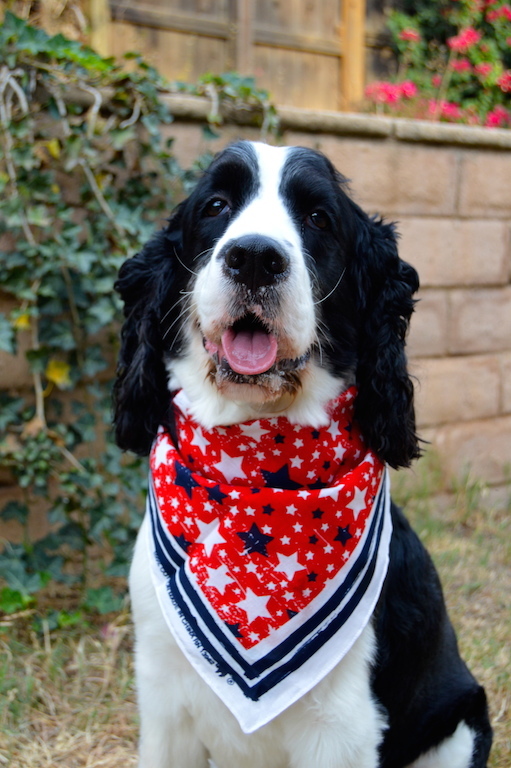 William, like his mom, likes to dress thematically for the occasion and all holidays, so he is sporting this bandana in red, white and blue, just like me! In case you were wondering where to get it, it's from Walmart, where all the chic English Springer Spaniels (and their moms) shop! Well I think both you and William are adorable in your red, white, and blue! 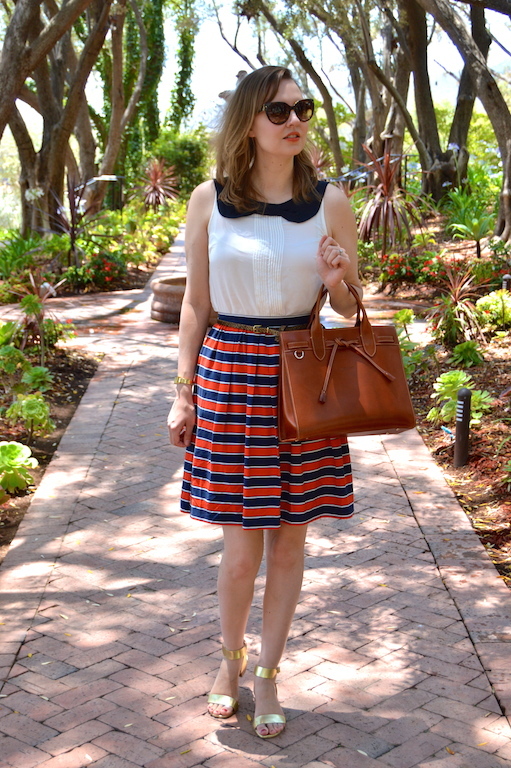 I love that skirt--it's such a classic piece. Hooray for finding hidden gems in your closet too, that top is a great one! 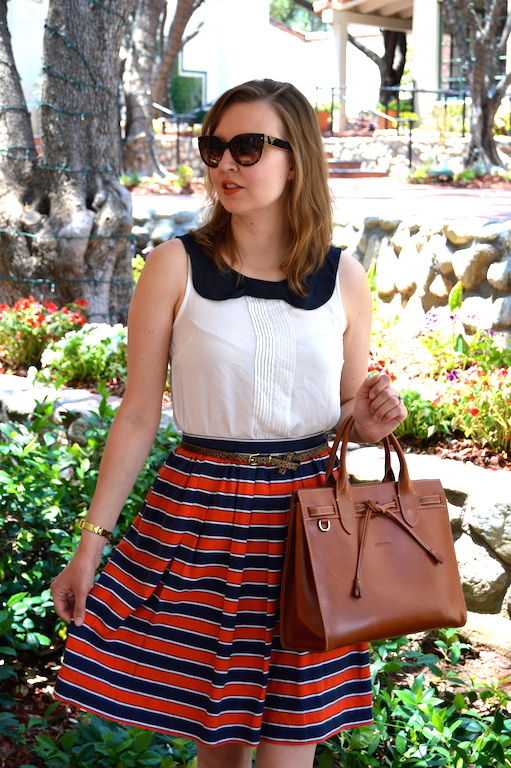 Love this patriotic look!! Even William is festive!! I am in love with your skirt! And it is so adorable with the Peter Pan collar shirt. Such a great look! And how cute is William?! 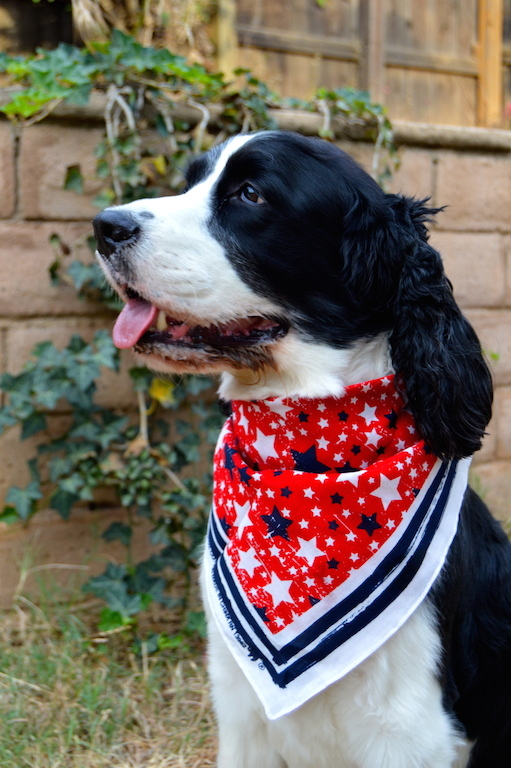 He is totally rocking his patriotic neckerchief! Please come by and join my On the Edge of the Week Link Up! It goes live every Thursday at 5:00 p.m. EST! Have a fabulous week. OMG both you and your dog looked amazing this year for the 4th. Love your skirt and top - both a gem. 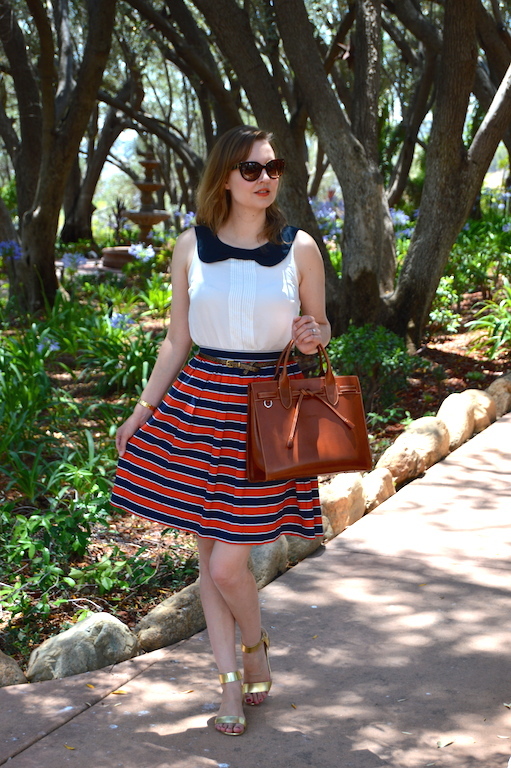 A fun, unique and girly take on a 4th of July outfit. Plus pairing it with gold sandals makes it fabulously nautical, too. Sorry I have been MIA but I have been on vacation. Don't forget to linkup with me on Thursdays, babe!